When DOTA 2 was first announced quite some time back, Valve mentioned that the game may need players to pay. Of course, most of us were rather disappointed as after all, we've played (the original) Dota for a long, long time, all for free. But nevertheless, it's beta was free and since we've got an invite, we didn't really complain much. But now that the beta has been going on for quite some time speculations and rumors have arise that Valve may have changed their mind about getting players to pay. Fortunately, Valve did. 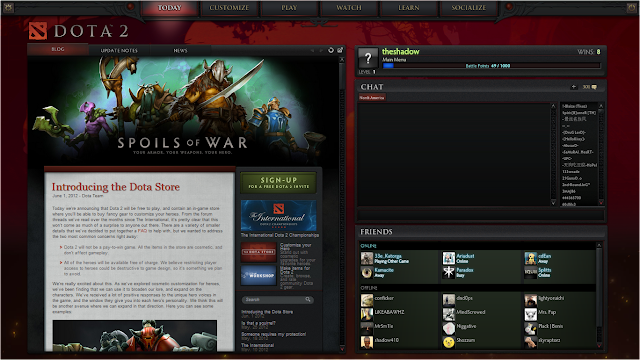 On their official Dota 2 blog, Valve recently confirmed that Dota 2 will be a free-to-play title. But if it is free-to-play, then how would Valve get their money back? Would they use a system like League of Legends or their (in my personal opinion) copycat rival Heroes of Newerth's, who restrict players access to certain heroes? The short answer is no, all heroes would be available free of charge. However, similarly, players will have the option to buy new skins for the heroes, or for this case, 'cosmetics' for 'customisation' which would be available in their newly-introduced Dota Store (which we would talk about it in more detail later).